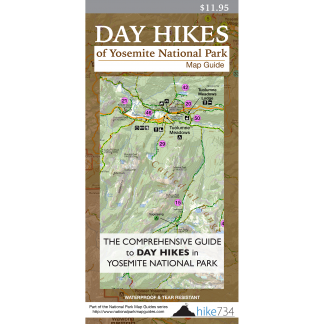 This hike takes you to an amazing, alpine landscape at Yosemite’s highest High Sierra Camp with many opportunities to explore. Take the spur trail south to the John Muir Trail and make a left to follow the Dana Fork upstream. The trail crosses over the Dana Fork before going up and over a small, wooded rise to Lyell Fork and the wonderful twin bridges. Enjoy the river and the meadow here before continuing on through the trees. Follow the signs for Vogelsang High Sierra Camp at the trail junction at Rafferty Creek. Views become limited as you begin the steep climb out of Lyell Canyon. Rafferty Creek isn’t that far from the trail, but remains mostly out of site until the trail eases its steep ascent to a steady, moderate grade. Great granite formations on Johnson Peak pop up to the west. 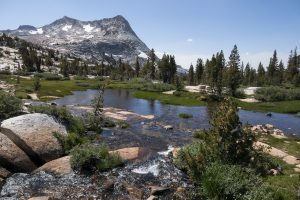 As the trail makes its final approach to Tuolumne Pass, it opens up into a large, wonderful meadow backdropped by Fletcher Peak. After a deceptively long walk through the meadow, you reach the pass. At the trail junction just beyond the pass, take a left to head up to the camp. You’ll traverse, with views of Boothe Lake backdropped by Rafferty Peak, then turn up towards the camp.